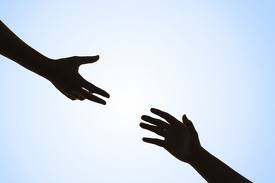 A Journey of Reinvention: Need a Hand? Does it sound familiar? I mean, have you been trying desperately to be all things to all people? To succeed at work, succeed at home, succeed with organization, cleanliness, finances, relationships, spirituality, time management, education... are you exhausted? I mean, because, I am. Jeremy Camp echoes this sentiment: "Have you been standing on your own two feet too long? Have you been looking for a place where you belong? You can rest. You will find rest." Look, you belong here. Not just on Earth, but here, on this Journey, with this group of people. You're trying to do it all, all by yourself, and you can't. We can't. You're going to fail. We all fail, in and of ourselves. But there's something inside of us that reflects bigger and better things. I encourage you to spend some time today listening and reflecting. Reflecting on what you're really meant for in life, but also reflecting what's inside of you that you're missing. Let this old life crumble. Let it fade. You were meant to live for SO MUCH MORE.